Wow, Wicked Saints is a ride. It’s a book full of mythology, gods, and politics. But there’s also romance, friendship, and self-discovery at the core. 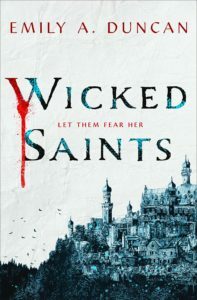 Wicked Saints is dark and brutal, glittering and blood soaked. It will make you question everything you know. It will make you fall in love with monsters in plain sight. I think if you have ever loved a villain, you will become utterly absorbed by Wicked Saints. But it’s more than monsters, blood magic, and heresy. There’s forbidden love, friendship in unlikely places, and a journey of self-discovery that will change all you think you know about this world. Fantasy is one of my favorite genres, but dark fantasy is slowly becoming one of my favorite. While I know it’s not for everyone, if you were ever craving more grit, high stakes with the world order in the balance, and a forbidden love that might just be unholy, then Wicked Saints is definitely for you. It’s a book that places you smack dab in the middle of a war that has waged for years. Wicked Saints is about desperation, saving our country, and sacrifice. It is a book about two countries fighting for dominance. One fueled on divine magic from their gods, the other by spell books and blood magic. It’s a conflict that begun even before the first cannons were fired. One that gets right to the heart of their society – a belief in powers that grant us magic, versus taking the magic from ourselves, our very blood. We can talk about the narrow strip of land between these countries, but at the core it’s about their fundamental beliefs being different. Calling one heretics, and another naive fools. The magic in this book was entrancing. Not only do we dive deeper into each of their magic, but through our characters we delve deeper into the trench between them. What is it like to rely on the gods? Does it mean we have given up our agency? It is a magic of sacrifice, of rules, and limitations. There’s religion, gods, and danger. When our power comes at the hands of others, to be denied, and for our life to hang in the balance. Combined with this world of iron and blood is a plot that will shock you. There are twists and turns in every corner and you aren’t sure if you can really trust anyone. The pieces start to click together in dizzying speed and you’re left reeling wondering which way is up. The foreshadow will put ice in your bones, goosebumps on your skin, and chill you to your core. So when the glass is clear, the surface reflected back at you, you will feel the world slowly tilt on its side. And yet our book focuses on these teens who just yearn for the war to be over. For their entire life to not have been a never ending war. They’re scarred by their histories, their secrets, and the ways they have been sharpened into weapons themselves. There are personal histories of rebellion and injustice. In Wicked Saints almost everyone is a varying degree of monstrosity. Whether it be what they are willing to sacrifice, the consequences of their actions, or iron claws. And yet they are all trying desperately to save their country, their home. Even though our characters do monstrous things, make mistakes, betray each other, we cannot help but love them. Because we see through their powers, through their treachery, to the heart of what they are – a boy afraid of the actions he set in motion, a girl who just wants a little slice of her life to belong to her, and a prince who drinks to forget the daily scenes of war. We see their flaws, Duncan doesn’t hide them, doesn’t shelter us as readers, but we also see their tenderness, compassion, and fear. Talk about complex characters that you can’t decide to love, hate, or fear. Not to mention that the romance in this book destroyed me. It took everything I love and twisted it into something I still love, and root for, but something just shy of almost unrecognizable. These characters of sharpened edges, monstrous secrets, and ulterior motives can’t help but cut each other. It’s about friendships that defy what we thought possible. And a love that by every stretch of the imagination should be destroyed, treasonous, and impossible. What better love to root for? It’s a shadowy and sparkling world stained with blood. There’s darkness, hope, and a forbidden love that may just tip the balance between dark and light. There are stories between chapters, histories, and pieces of the world sewn into every page. And at the heart of Wicked Saints is a discovery of agency, of the choice to plant seeds of doubt, to finish what we started, and to question. It is a book that will keep you hooked, will make you gasp aloud, and destroy you. Find Wicked Saints on Goodreads, Amazon, Indiebound & The Book Depository. I can just imagine all sorts of amazing dark bookish swag for this book, what is your favorite type of bookish merch?